These titles will inspire and educate young adults, whether they use them for personal research or for study. Paige Rawl was like any other girl, as far as she knew — sure, she had to take medicine everyday and visit hospitals, but didn’t everyone else? What Paige doesn’t know until she’s older is that she was born with HIV. As long as she (and her mother) take their medications, they’ll be healthy and able to live normal lives. As a middle schooler, Paige is a cheerleader, competes in pageants, and has a great life; HIV doesn’t stop her. Yet the day she decides to confide in her best friend about her health condition is where everything starts to go wrong. Her best friend spills her secret, and soon the entire school knows. Paige finds herself bullied everyday with a horrible nickname — “PAIDS” —- and develops stress-induced seizures as a result. School administrators and teachers do nothing to help; instead, they blame her for bringing “drama” to the school. Paige’s story about mental health, bullying, and the importance of being positive will inspire readers to make changes in their own lives. What could be a daunting and incredibly depressing book to read is saved by Rawl’s narrative. Written in a conversational tone perfect for tweens and teens (but possibly less challenging for adults), Rawl is able to convey the horrors she faced without scaring off the reader. During the periods in which she is describing her bullying, the tone is certainly dark, but she manages to intersperse positive moments in between. Not only does this help to vary the tone of the book, but it also shows the reality of the lives teens live: not every moment is dark or horrible. The primary theme is positivity and overcoming one’s obstacles. Rawl encourages teens not only to be kind to one another, but to seek out support and be strong and positive. While teens cannot always change their circumstances — Rawl has HIV and cannot change that — they can control their reactions and attitude. By seeking positive influences and arming oneself with a support network, teens can move forward through obstacles and learn that they can rely on themselves. Paige Rawl has a secret — she’s HIV positive. When her secret is leaked to the entire school, how will she cope? Paige was born HIV Positive and bullied severely in middle school because of her HIV status. Her classmates called her cruel nicknames, such as PAIDS. Her soccer coach even made a joke about how her HIV status could help the team. And the school administrators let her down by not protecting her. After leaving her middle school, she decided to take a stand and started to speak out sharing her story. At the age of fourteen, Paige was granted special permission to become the youngest person to ever be certified through the American Red Cross as an HIV/AIDS Educator. She even pleaded to congress in her home state of Indiana and helped pass the Anti-bullying Bill #1423 that was affective July 1, 2013. Have teens imagine what it would be like to have their biggest secret leaked to the entire school. What would they do? As one explains the book, have teens act out Paige and her best friend telling her secret, as well as other scenes from the book. Have teens act out what they think they’d do if someone told them that gossip. This book resonates with teens because they can relate to being bullied for something they can’t change. When this book has been presented at a booktalk, teens have been very interested in how Paige overcame her bullies and how she was able to become the successful adult she is now. It also helps teens understand HIV and how people with it can still lead normal lives. ISBN: 978-1626259904, Instant Help, 2018. As an experienced psychologist, Sheela Raja has helped all sorts of patients recover from trauma. Her teenage daughter, Jaya, has experienced anxiety and watched her friends struggle with heavy issues, such as eating disorders or violence. Together, they offer a look at Post-Traumatic Stress Disorder (PTSD) and how one can recover from it. Aimed specifically at teens, this book provides a definition of the disorder, common signs and symptoms of it, and easy tips for teens on how to start healing, such as journaling, exercising, or managing your moods. Written in a conversational, non-judgemental tone, teens with trauma can learn realistic ways to tackle their issues. While Sheela provides clinical evidence and recommendations, Jaya adds in anecdotes about her own life — some things she’s experienced, and some she’s seen her friend deal with. Throughout the short book, teens are encouraged not to blame themselves or think of how they could have prevented the trauma, but instead encouraged to look forward. This book is incredibly accessible for the resource it is, due to its easy-to-understand language and short sections. The information is scientific and the language does not condescend to the reader, but instead takes difficult concepts and topics and makes them teen-friendly. The book does well in juxtaposing the author’s two voices; the daughter’s voice is clearly that of a teen, and so will be relatable to teens. The language is also successful in conveying the gentle, non-judgmental tone of the book. Teens with PTSD have likely already blamed themselves enough for their trauma; the last thing they need is a book that will do the same, too. The book emphasizes self-care and that what happened is not the fault of the reader; however, the authors encourage the teen to move forward and begin healing. The book is worthwhile due to the variety of topics is covers. It manages to discuss different forms of therapy and treatments, unhealthy and healthy coping mechanisms for teens, and easy tips for teens when they feel stressed or triggered from flashbacks. The book does not shy away from some of the things such teens deal with, and is honest in its advice to teens, but manages to do so in a non-exploitative or graphic way. Do you struggle with anxiety, stress, or flashbacks due to a past trauma? Learn easy tips on how to heal and move forward. Sheela Raja, PhD, is a licensed clinical psychologist and associate professor at the University of Illinois at Chicago. She completed internship and post-doctoral training at the National Center for Post-Traumatic Stress Disorder in Boston, MA, and has published numerous articles exploring the relationship between physical health and traumatic events. Dr. Raja has a passion for making evidence-based psychology accessible and is a frequent contributor to various print and national television media outlets. Have teens write down their top tips to deal with stress. Collect and share with the class. Many texts aimed at those suffering with PTSD are aimed at adults; teens need a guide with accessible language for them. Written by a professional, this guide is backed by scientific studies, but is also compassionate and gentle. ISBN: 978-1984801838, Random House, 2018. Step into the lives of the Parkland survivors as they describe the hellish moments as their lives — and this country — changed forever, and how they turned that tragedy into a movement. David and Lauren Hogg, siblings, discuss their lives before the school shooting, painting them as normal teens. Although they hate moving to Florida from back home in California, they adjust. David discusses how he evolved from an “edgy,” insensitive teen to a thoughtful, intelligent young man committed to bettering the world. As they both navigate their new lives, the unthinkable happens — a shooter wreaks havoc on their school. David and Lauren both discuss those moments where time stood still. As survivors, both detail the nightmarish aftermath of the shooting, and how both were inspired by their anger and grief to start a movement. Included in the book are recommendations by the Parkland survivors for legislation and change, provided in easy to understand language. This book is perhaps much smaller and shorter than one would expect, and lacks the depth that such a topic and such experiences could use in a book like this, but still manages to be worthwhile because of the themes included in it. Both teens use their stories to express the horrors of their experiences, and use their language to instill urgency and anger in the reader so as to inspire action. Because of this language, the book is certainly not neutral or nuanced in its tackling of the subject, which is expected given the first-person POVs — additionally, informing the public via facts is not the purpose of this text. Both teens are honest in their indictments of school shooting, gun control and the NRA, as well as the government. The theme and message of the book is that, as the title would suggest, such horrific acts cannot be tolerated or ignored any longer. The teens, and the movement they represent, demand action now, and that urgency and energy permeates throughout the text. What is loses in presenting more in-depth research it makes up for in style and imagery, as it so clearly conveys the emotions of the teens both in the school as the shooting occurred, and how they feel now. Everyone’s heard about the Parkland school shooting. But do we know their stories of the survivors, and how they were inspired to start the grassroots #NeverAgain movement? 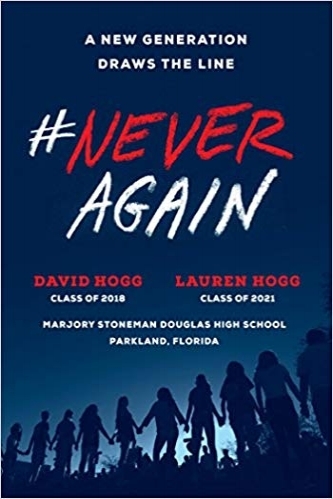 David Hogg (Class of 2018) and Lauren Hogg (Class of 2021) attend Marjory Stoneman Douglas High School in Parkland, Florida. They are both members of March for Our Lives. Have teens write a five point list of how they can improve their country. Is the exercise difficult? What are the ideas everyone can agree on? Lead into the movement created by the teens and the book. This is short and engaging enough to hold the attention of even the most distracted reader, while providing deeper insights to readers looking for discussion. Teens are so incredibly familiar with school shootings; they are used to drills and like many, no longer feel shocked when these events occur. Such a book can help teens think more critically about the issues, and show them that they, too, can change the world for the better and become agents for change. Students of the Oakland International High School are like other high school students in the U.S.— they like playing video games, reading, watching TV, and hanging out with friends. They also struggle with poverty, separation from loved ones, and trauma. These students, which include refugees, immigrants, and those who are undocumented, pose for candid photographs and share their stories, some of which are sweet and uplifting, and some of which are heartbreaking. They describe their homes, how they came to Oakland, and how they feel about the U.S. The most interesting question: what makes a home? For many students, simply the most important things in life: love and safety. While every teen has a different story, readers can see the commonalities between the students, and between other teens in the U.S., and gain perspective on their own lives and struggles. Students in the book hail from countries across the world, including El Salvador, Mexico, Malaysia, and Afghanistan. The photographs are candid, well-lit, and incredibly natural and paired well with the text. The book is more interesting because the poses of the teens vary; some are together, hugging and laughing, while some are by themselves, looking more pensive. Readers can enjoy learning the stories and backgrounds of the teen while looking at them, considering how their appearance would or would not suggest their struggles and happy memories. The black text on white pages and bright photographs help to balance of the tone of some of the interviews, which can be sad. Even if one did not read the notes provided by Thi Bui or the school’s administrator, it would be clear that the purpose of the book to show how immigrant teens are similar to American teens. They share the same hobbies, loves, and misfortunes; teens reading can quickly see how easily their lives could have been different had they simply been born in a different country. The book could have expanded the interviews and varied them more to provide more information and to help the reader better connect with subjects — after reading so many, they start to blur — but the book is successful in showing the real lives of immigrants, which are complex and not always dark or depressing, but three-dimensional. How much can you tell about a person from just a simple photograph and interview? Rachel Neumann is a Bay Area-based writer whose work focuses on civil liberties, human rights, mindfulness, and the intersection of parenting and progressive politics. She is the author of Not Quite Nirvana (Parallax Press), a contributor to the anthology The Battle of Seattle (Soft Skull Press), and the co-author of Healing (Parallax Press). She is a contributing writer to AlterNet.org and her work has appeared in The New York Times, The Village Voice, The Nation, Dissent Magazine, Shambhala Sun and many other national and local magazines. She is the editor for Zen Master Thich Nhat Hanh. Have teens pose for photographs and interview each other asking the same questions teens in the book are asked. Many people, including teens, are fans of the popular “Humans of New York” Facebook page and books. In this project, teens can see how similar we all are, and how what matters most, love and safety, is important to us all. So many teens hear about refugees and immigrants in the news, but may not have any personal experience with any, so this book can help spark empathy. ISBN: 978-1936976553, Zest Books, 2014. Liz Prince is a tomboy. At least, that’s what she’s called by others who just don’t “get” her. She doesn’t fit in with the girls she knows, but she doesn’t quite belong with the boys, either. As she grows up, she struggles to find her place: is she feminine? Is she masculine? Is there room to be something else? Maybe for some people, this limbo could be navigable, but for Liz, it’s a frustrating and alienating place to be. Any decision she makes about her identity seems to be wrong, especially as she subverts the expectations and labels people place on her; for example, she angers a male friend when she stands up to his bullies. As Liz grows up, meets new people, and enrolls in an unconventional school, she begins to learn that what other people think of you — how they force you into labels — doesn’t matter as much as how you see yourself. While the art is not as detailed or intricate as that of others, it serves the story well. Prince’s art, along with her writing, helps to showcase her humor and voice. Prince’s humor is self-deprecating and relatable; although not all people, or even women, have struggled with their gender identities, all have been bullied and gone through the awkward years of puberty. Rather than making her story sad, Prince finds a way to simply engage the reader in her road to self-acceptance. Prince’s memoir is not explicitly feminist, but it engages in feminist themes. Prince discusses how men and women are judged differently; while men can be conventionally unattractive but appreciate for their talents, women often face harsh judgment for looking less than perfect, regardless of their humor, intelligence, or talent. Additionally. Prince subverts the common trope of hating other women or girls, instead encouraging people to accept all genders and expressions, and to stop labeling ourselves and each other. Have teens anonymously share the stereotypes and labels they were given as a child. What fits, and what never did? Have teens draw a panel of themselves as children. So many teens can relate to the feeling of being different, or feeling like they don’t belong. Many others have been labeled or stereotyped when they don’t act feminine or masculine enough. 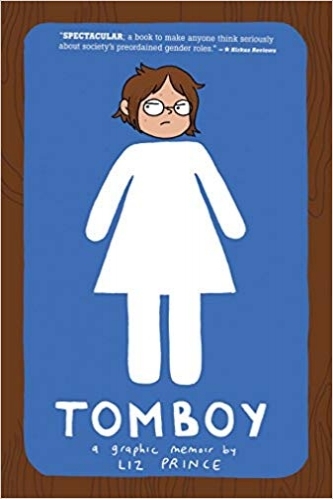 Teens can enjoy the humor and art of this memoir while taking in deeper ideas about being yourself and not forcing yourself into a box.